Over the weekend while I was picking out some canned goods from my pantry to donate to my work place's annual Hawaii Foodbank food drive, I noticed that I had a lot of JELL-O. 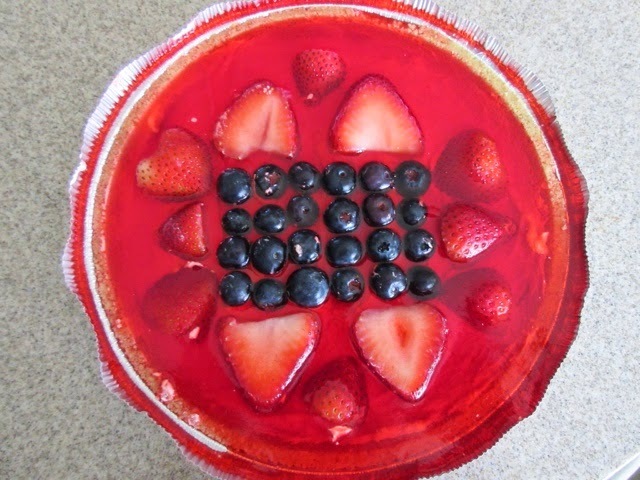 That inspired me to make something with JELL-O - Summer Berry Cheesecake Pie. This dessert is very easy to prepare and uses very few ingredients, most of which you probably already have in your kitchen. Baking is not required (the recipe calls for a ready-made crust), which means all you need to do is prep and let it set in the refrigerator for 3 hours. It's the perfect recipe when you don't have a lot of time to prep/bake. But you do need to let it set for a few hours, so just prep it the night before and it'll be ready to go the next morning! 1) When spreading the cream cheese/Cool Whip mixture onto the pie crust, don't fill it too high otherwise you won't have enough room for the Jello. I would recommend filling the crust to the 1/2 or 2/3 imaginary line. You will have leftover cream cheese/Cool Whip, which you can use as a dip for any leftover berries you may have.